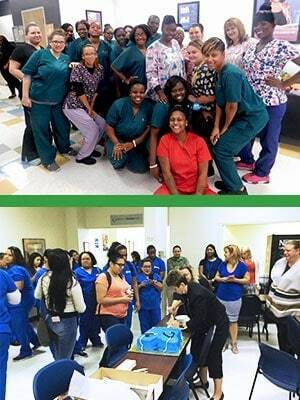 October 24, 2016, All Locations – American Institute joined the nation again this year in celebrating the contributions and dedication of Medical Assistants during Medical Assistants Recognition Week – “MARWeek” – an annual event sponsored by the American Association of Medical Assistants (AAMA). Medical Assisting students and staff at American Institute were treated to appreciation meals and a special message from their Campus Presidents. “As providers of healthcare career education, we’re close to Medical Assistants while they are training and once they go into the field, so we know just how hard they work to ensure exceptional patient care,” said Christopher Coutts, Chief Operating Officer. “It’s a challenging role, yet we see Medical Assistants provide caring smiles and good humor each day, because they love what they do and the people they help.” “The Heart of Healthcare” is the theme of MARWeek, a reference to the critical role Medical Assistants play helping to ease anxiety and enable patients to effectively engage with their health care providers. “Students choose Medical Assisting because they truly care and want to help people,” said Brooke Baran, Vice President of Education. “Our hands-on training program, which includes mock patient visits and role plays, prepares our students to confidently take their place on the medical team.” Healthcare providers recognize that having skilled, caring professionals on the front lines improves the patient experience, which can contribute to better health outcomes. As a result, Medical Assisting is projected to be one of the fastest growing occupations. * “I’m personally grateful for the Medical Assistants who have assisted me and my family through some difficult moments,” said Mr. Coutts. “It’s important to recognize their contributions during MARWeek and throughout the year.” *Bureau of Labor Statistics, U.S. Department of Labor, Occupational Outlook Handbook, 2016-17 Edition, Medical Assistants, on the Internet at http://www.bls.gov/ooh/healthcare/medical-assistants.htm.